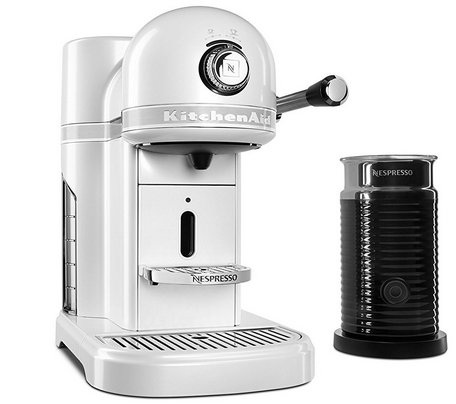 KitchenAid’s KES0504FP Nespresso (View on Amazon) maker with Milk Frother combine the company’s premium and iconic metal design with a groundbreaking technology that’s going to redefine de classic taste of espresso coffee. With a nineteen bar pressure system and a wide range of features, such as incredible coffee making consistency and convenience, the KitchenAid’s Nespresso is hands down one of the most impressive coffee machines currently on sale. Not only that, but its design also make it look amazing on your kitchen countertop and it’s sure to attract a lot of compliments from visitors. The KES0504FP espresso machine features a die cast, all metal construction that guarantees you’re going to get many years of use out of it. Not only that, but it also has a premium, timeless and durable design that combined, make it look like a statement piece that looks perfect in your kitchen. The water tank on the KES0504FP can be easily removed for filling and cleaning purposes. While it’s not exactly as large as that of other similar machines, the one point three liter water tank is enough to prepare several espressos that you can enjoy with your family or friends. The cup shelf is adjustable, meaning that if you want, you could use smaller or larger espressos cups. For convenience, KitchenAid has opted for a foldable design. All you need to do in order to prepare a delicious espresso is pour the milk and then press the button. Within seconds, you’ll have a delicious drink with a great aroma and rich flavor ready to be enjoyed. The KES0504FP can help you prepare nespressos using both cold and hot milk. Unlike other machines out there, you don’t need to worry about using milk at a certain temperature if you want to be able lot enjoy a delicious espresso drink. If you’re tired of espresso machines that vibrate and make a lot of noise when in use, then you’ll be happy to know that the KES0504FP is very quiet. In fact, it’s so quiet that you can even use it at night without worrying about disturbing the neighbors. The KES0504FP is built like a tank and is therefore expected to last many years before you can even think about servicing it. It is indeed very heavy at twenty four pounds, but it’s certainly going to last you for many years – guaranteed. Upon purchasing it, you’ll receive a total of sixteen capsules of Nespresso coffee in various flavors. No matter the pods you’re using, the machine is always able to produce consistent results. The milk froth function of the KES0504FP is highly regarded by a lot of those who’ve used it and it helps you make great frothy milk for a delicious latte. One thing you won’t like about the KES0504FP is the fact that it comes at a steep price. On top of that, the Nespresso pods can get quite expensive when you factor in how much they cost over a period of 3 months. Tossing the Nespresso pods in the garbage can is not really helping the environment. After partnering up with Nestle, KitchenAid seems to have managed to create a very special machine that is already appreciated by tens of thousands of people who love preparing and drinking delicious lattes or espressos. The KES0504FP is very well built and seems to look simply amazing on your kitchen countertop. Better yet, it comes with a wide range of features that guarantee making an espresso is going to be as simple as pressing a few buttons. And if you go online, you’ll notice that most of those who use it already have rated it highly on the majority of review websites, including Amazon of course. And why wouldn’t they? Thanks to its solid build quality, ability to help you prepare delicious espressos in seconds and the fact that it also comes with about sixteen pods upon purchasing it, you’re certainly going to be very happy with what this machine can do to satisfy the coffee lover in you. Overall, if you cannot afford getting a manual espresso machine and want something a bit easier to use, then you may want to give the KitchenAid KES0504FP a try. We’re sure it will surprise you in more ways than one! Nespresso C122-US-CR-NE: If you’re in love with the taste of the espressos the KES0504FP is able to prepare, but you cannot afford it, then you should go for this model. It’s from the same company and comes at about half the price, while still being able to prepare great tasting coffee. DeLonghi Silver Lattissima Plus: The Silver Lattisima Plus from DeLonghi is an excellent choice for those who are looking for something else, where “something else” is an Italian quality coffee maker that will surprise you with its excellent functions and flavor rich espresso shots it can pull. Even more, the Lattisima Plus features an energy saving timer which automatically turns it off after a certain amount of time, but also a patented coffee capsule system you’re never going to get enough of. De’Longhi America EN750MB Nespresso Lattissima Pro: Yet again a DeLonghi in our recommendations, but that shouldn’t come off as a surprise, since they’ve been in the industry for years and know a thing or two about what makes a great quality espresso machine. The EN750MB comes at approximately the same price as the KitchenAid KES0504FP, features a sensor touch display and has a very modern looking design. You can also choose among six pre-programmed drinks, which include hot milk, latte, cappuccino, lungo, but also espressos and ristretto. On top of that, the EN750MB also has a function for tea.